If you are a clever trader, what you should do is, you do not enter either long or short at 38.2% retracement,(Though all parameters allows you to do ) but instead wait for the perfect reversal happening at 38.2% retracemnt. And the sell signal comes after the announcement of BAD IIP no’s. 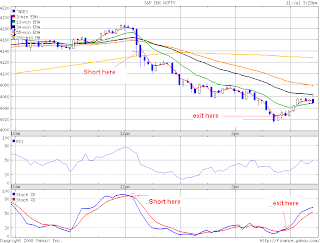 Also if u notice the 200Min MA i.e 4135 act as a intraday support level. breaks then huge carnage… ie Nifty moved from 4135 to 4015.